I first discovered Ayn Rand's novels while backpacking through Europe with a friend in my early 20s when we found a copy of The Fountainhead in Spain. A number of years later I read Atlas Shrugged while holidaying in Vietnam. 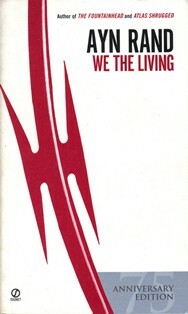 More recently I came across her first novel, We The Living, while travelling through India. While it is coincidence that I read all three books while travelling, it is also fitting. Rand wrote fiction to illustrate her own personal philosophy so it's helpful to approach her writing with an open frame of mind. Rand was born in Russia in the early 1900s. She lived through the Russian Revolution and oppressive conditions of Soviet rule before escaping to America in her early 20s. Her subsequent and fierce anti-collectivist stance is reflected in all of her books. Of Rand’s three novels, Atlas Shrugged (first published in 1957) is the best, although at more than 1000 pages it's not for the faint hearted. We The Living is an easier (and shorter) read and I liked the characters more. First published in 1936, it tells the story of a young woman, Kira, and her struggle against communist rule in 1920s Soviet Russia. Rand wrote We The Living at a time when the western world was oblivious to hunger and oppression in Russia and the communist movement was starting to gather pace in America. It’s a love story with a twist, as well as a criticism of dictatorships and the nature of collectivist ideals. Rand's writing isn't for everyone, but if you read this book and enjoy it, give Atlas Shrugged a go. Thank you to Sarah for helping me to discover Ayn Rand in a bookshop in Spain all those years ago. Would you like to receive news and interesting facts about books from around the world? If so, follow me on Facebook here and on Twitter here.